This weeks theme is "BIRTHDAYS"
This will be a fun theme because everyones interpretation is always so unique. We look forward to seeing your photos. And thank you so much for coming back every week to enter. We love having you! To see all the rules for this fun party, please go HERE. And don't forget to tell your friends that you entered your photo so they can come by and vote for you! VOTING... 1 Vote per person and please NO ANONYMOUS VOTING... they will not be counted. COMMENT as much as you like. Everyone loves FEEDBACK! 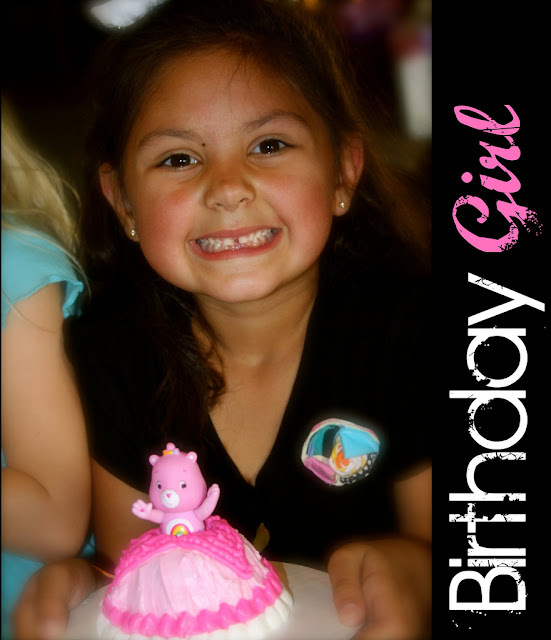 My Birthday Girl turned "6" last week. Her birthday party was this past Sunday and as you can see from the cake, it was a Care Bear themed party. It was so fun. She had a blast. I can't believe my baby it 6. Oh and she lost her first tooth on Saturday. Very exciting!!!! One of her bottom teeth. You can't see it in this photo. LOL I look forward to seeing all your birthday photos. This is from Micah's first birthday! It's still one of my favorite birthday photos! I love that second photo. Too cute! The picture from Jill@ Two of a Kind is too cute! Dina @ 4 letter words would get my first vote and a very close second would be just the 2 of us! Great job everyone. Am I voting in the right place? My vote is for Delicious. My vote goes to Dina @ 4 Lettre Words.